“Norton today unveil their all new V4 bike, featuring the new Norton 1200cc engine and tubular aluminium chassis, all bikes are to be hand built at the Donington Hall factory. The bike will be publicly unveiled for the first time at the UK’s NEC Motorcycle Live show in Nov. 2016. With deliveries expected in mid 2017. Cycle News concludes that a “huge range of upcoming models for Norton” will follow the V4 1200. We would love to see it. Why all the negative crap? Lets see what its like when its released. Isnt any new Motorcycle exciting? It has two wheels so that’s a good thing right? Anyone remembers Norton Nemesis? Different entrepreneurs, true, however same b$&@it is my prediction. They did not manage to build a simple engine themselves, let alone a complex v4……. The dude is quite skilled at one thing at least: world-class hyperbole. MCN here in the UK says 100hp / 100kgs. Just what the world needs, another overpowered, overpriced, and ridiculously complex sportbike. If you’re just going to follow the competition Norton, why bother? If I was dying for a 1200 V4, I’d get a Honda with proven reliability long before paying more for a faux Norton. How about a new 850 Interstate with gobs of torque and reliability? Go with fuel injection and water cooling if you must, but keep it as simple, elemental and classic looking as possible. Most importantly, price it like a CB1100. Such a bike would carve it’s own niche. If you’d choose the VFR1200 over this, then you have your own questions to answer. It’s possibly the dullest ‘sport’ bike you could ever consider. Oh yeah, so you want top spec and build quality at bargain-bin prices. Consider the second hand market, it’s right there looking at you. Made me look at their Web site. I didn’t even know they were building. Really incredible looking bikes. Maybe the future of bikes is 2 wheeled suv’s with sawed down car engines. Direct injection vs superchargers getting 100 mpg instead of 200hp but they look good. Norton has always built beautiful bikes, and this is no exception. They already have a line of retro styled Commando’s…would like to see a slightly modernized Atlas as well. All the best for their success. I call total BS on those numbers. It would need race gas and probably nitrous. Also you won’t get 3,000 miles before it falls apart. Oh, the places they won’t go. This has as much chance as I have of competing in the 2020 Olympics. What event are you in Wendy? Excellent reference for all us old farts. Well played, sir. Delivery should begin right after the first Elio’s are delivered. 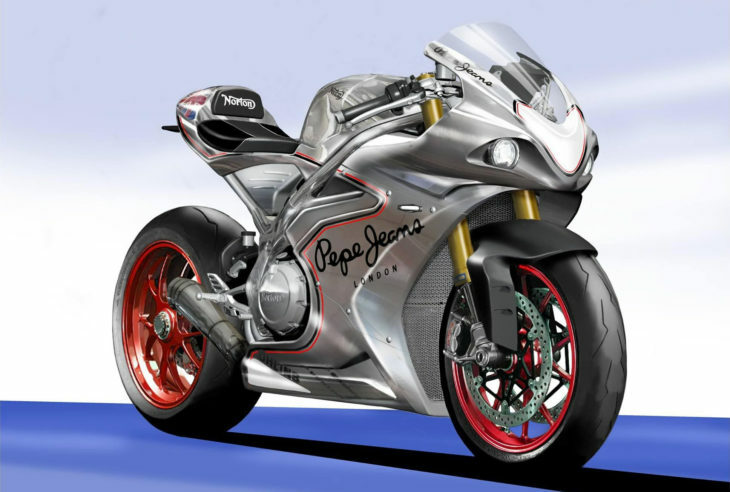 Norton is a world-class leader in producing cutting edge motorcycle design renderings. What a waste of the legendary marque. I can’t even imagine the name going on something that doesn’t honor the past in some way. Yeah, it’s been tried and failed, but it should be tried again. This thing simply borrows styling ques from every where. And I think the ultra narrow niche/boutique bikes shouldn’t even be considered news. Must be a slow news week. This kind of products can only be produced at stratospheric prices and the company has to be backed my strong sales or affordable (read profitable) products (Veyron by Volkswagen Golf made in Mexico, Valkyrie Rune by millions of CB125s sold in China, india and latin america). I wonder if this will be as much of a failure as the commando was. Norton joins the twentyfirst century. Welcome to the future. Well, they better do something fast, with the sales pummeling I’m sure the Thruxton is delivering to the 961. I wonder if Garner and Bloor still are on talking terms? I sounds interesting. But Norton and almost happened but not quite are somewhat synonymous. See note below Re. “unveil.” Let me see…the bike shows in three months, but no photos available today, only renderings. Right. The author types a comma where belongs a period? Really? I just read Norton “today unveil.” Is it November already? Calendar impaired, much? Best wishes if you “expect” more than more renderings “mid 2017.” I doubt the last sentence is one. Translation: Naive and/or stupid persons w/more money than brains, please apply. The more of both qualities, the better. While we traipse down this path: I wish Suzuki would release that sweet six-cylinder concept bike circa 2010. OK, I lied above. Dirck, beyond a certain point of ridiculousness, are you not obligated to read the supplied text and RTS unpublished? The only exception would appear to be to lay naked Norton’s utter imbecility, a task certainly fulfilled. It’s the audio track on the videos… remember the high performance headphones dammit!!. Maybe get a day job to afford headphones that did not come free in your Cocoa Puffs box. Most of the grammar crap you are on about is the difference between English English and American English. Don’t let it get under your skin buddy. Grammar check is your friend.